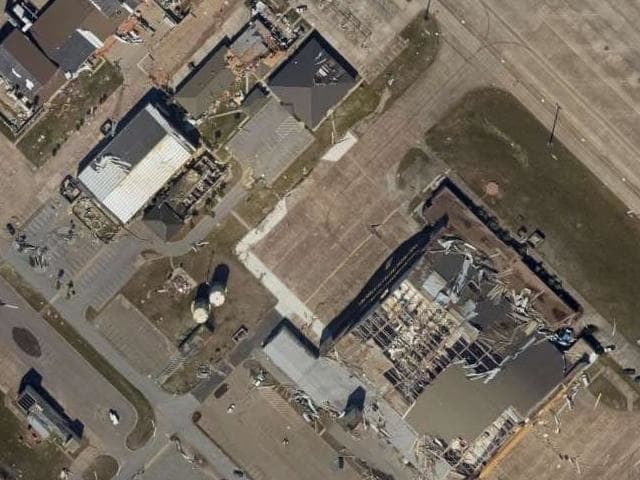 As the following report relates up to 22 of America’s most advanced stealth may have been damaged or destroyed by Hurricane Michael, which passed through the US Air Force’s Tyndall Airbase in Florida. However, there may be more to this than there seems. Admittedly it’s speculative but it’s also intriguing and very plausible. The alternative explanation as to what has really happened follows this report. Ed. THE US Air Force’s Tyndall Air Base in Florida has taken a direct hit. Many of its ultra-advanced F-22 Raptor stealth fighters have been caught on the ground. Exactly how many of the $475 million aircraft were damaged or destroyed by Hurricane Michael has not yet been revealed. The United States Air Force could only afford to buy 187 operational examples of the 5th generation stealth fighter. Now, that number may have been significantly reduced. US authorities won’t yet confirm or deny the details. Standard procedure is for all combat and support jets to fly to safe havens ahead of such an intense storm. But not all are able to get into the air. Complicated aircraft such as the F-22 must spend much of their time in hangars having their electronics, engines, equipment and structure being maintained and repaired. So when Hurricane Michael slammed into the Florida Coast near Tyndall Air Force Base on Thursday, an unspecified number of the 55-strong Raptor fleet was still on the ground. Almost all personnel had been evacuated from Tyndall before the Category 4 hurricane crossed the coast. Air force officials admit returning assessment teams have found “widespread catastrophic damage”. We know 55 Raptors are based there. That leaves 22 of the $475 million warplanes unaccounted for. Unconfirmed reports suggest at least six — and possibly many more — were forced to seek shelter in the air base’s ‘hurricane-proof’ hangars to tough out the approaching storm. But Tyndall took a direct hit. Ok, so here’s the story. Supposedly 22 F-22’s were left behind at the base and were destroyed by the hurricane. That’s a 7.5 billion loss. Problem: I only saw two F-22 type planes in the photos, one was a prop at the front of the base, and one was in a hangar and “experts” were saying it was a different plane. Many people are now suspecting that these stealth fighters, that cost $350 million each, were given to Israel with Michael as a front for where they went. THAT would be a PRIME reason to beef up a hurricane and front their loss. Israel needed to offset the S-300’s and the F-22 was the only plane that could do it. The Washington Times is claiming the planes were lost. But I seriously doubt the air force would be stupid enough to leave them behind, NO MATTER WHAT. Supposedly they were not flight worthy. But there’s a difference between “flight worthy” and flight worthy, only a fool would believe they let them just sit there. You can damn well bet they could take off, even if not approved for flight. And I’d bet they did. Now, the question is, where are they?